Pushtimarg is an integral part of Hinduism. Thus it is given that you must follow the covenants of Hinduism. When you take Braham Sambhand you offer all your belongings to Thankurji. Belongings are both material and non-material. Since you have offered to the feet of Thakurji you possessions now belong to Thakurji. It becomes your spiritual duty to serve Thakurji in every way possible. Sustenance of physical life does continue so that you may serve Thakurji. The prime directive being a Vaishanav is to offer everything that you use after taking Braham Sambhand to Thakurji. This is to keep future conducts in line with the oath that was taken initially. This means that the food you eat, the water you drink, clothes you wear and the car you drive all of these and many more things should come in contact with Thakurji so that they are blessed and fit for the consumption of their servant. Great importance must be paid to the observance of this directive. This is the fundamental difference between Pushtimarg and other paths. In order to follow this directive supplementary measures need to be taken to maintain sanctity when offering food (Bhog) to Thankurji. It must be realised and noted that the prime directive takes precedence over the adherence of the supplementary measures. Supplementary measures are a nicety and all reasonable effort should be made to maintain sanctity. What it means being a Hindu? The list below is in the order of importance. Abstain from smoking and other forms of addiction. As we approach the 21st Century many of these concepts seem outdated and are not being adhered to. The list has been compile in the order of importance. Being a vegetarian is of vital importance. If you cannot adhere to this then can you be called a Hindu? This question has to be wrestled with your own consciousness. Only you can answer it. 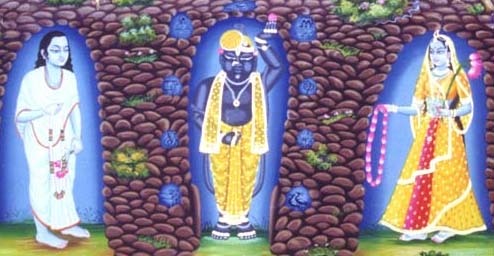 Belief in God (Shree Krishana) being the Creator, Sustainor and Destroyer of the world. Whilst India was occupied by the Mogul rulers they ordered all the people who wore the kanthi and tilak to either remove them or to be crushed at the feet of an elephant. Vaishanavs have given their lives to maintain the tradition and refused to take off their kanthi and their tilak. What are we going to do to honour those should who have set for us an example to live by? It is of the greatest importance that the kanthi should be around our necks regardless of the cost. That will be a test of your dedication. Schools ask children to remove them. Just say No! It is a emblem of your religion and they cannot force you to remove it. This has to be taught to the children so that they can remember it and adhere to it whilst at school. The young seedlings have to be taught well to maintain the continuance of our tradition. As parents it is your duty to look after the welfare of children. Give them a gift that no one else can give. Teach them about the welfare of their soul! They might thank you for it but more importantly Mahaprabhuji will be happy. So will I. In the modern we might want our path to be kept a secret. Wearing a tilak for a man who works in the office might not entirely be possible. In that case you can bear the tilak on your chest. This is quite acceptable. We have already highlighted the importance of taking Braham Sambhand. The keep your mind cleansed the least you can do is: Daily recite paths and do mala. Mala is generally consisting of the 8 letter mantra or the 5 letter mantra. Doing mala is the process of reciting the relevant mantra with the aid of rosary beads. A mala is reciting a mantra 108 times. We can note from the stories of the 84 and 252 illustrious vaishanavs that many of the performed swarup seva. Swarup (is the idol) seva is process pretending the swarup is your child and hence seva is looking after that child. This is done by bathing, dressing, feeding etc. To do this seva is an aim that vaishanavs must have. Through swarup seva you can really appreciate the beauty of Pushtimarg. Visit your Guru (other resident Balaks) as many times as possible. Whenever you visit them never go empty handed. Take something to offer their Thakurji and to them. Make a habit of donation/ contributing seva on a weekly basis. The means to attain God are many. Some are difficult some are easy. All are fairly long journeys. "A minuscule part of Me is present in all living things"
Jiva has Bhagwad ansha; a minuscule part of God. This truth is difficult to comprehend because we do not realise the closeness we have with Thakurji. We have become engrossed in the material world. Our lives are full of activity hence we rarely ask deep rooted questions about who we are, where we are going. On Sharawan Ekadasi Mahaprabhuji along with Damodardas Harsaniji were at Gokul on the banks of Shree Yamunaji. At Govind Ghat (ghat is a area which allows safe access to the river that flows). Shree Mahaprabhuji was perplexed by a thought. How do the divine beings get seva or an opportunity to serve Thakurji? (Or something) in this Kali Yug. More specifically the Vedas do not have a means of liberating Women and Sudhras (define castes). Therefore what was to happen of Women and Sudras. This was the question that Shree Mahaprabhuji was worried about. Then at about midnight Shree Nathji appeared (in Lalit trabhangi mudra) and ordained Mahaprabhuji. The divine souls should take Braham Sambhand. In order to be fit to receive communion with Thakurji their "doshs"will be absolved. In particular 5 main types of doshs will be removed. Once this is done I (Thakurji) am ready to accept the soul. After Braham Sambhand they should offer everything they partake to me first. Then to take themselves. Therefore everything we take must be offered to Thakurji as already mentioned.